If you are concerned with home security, you might be thinking about installing an alarm system. Installing a home security system is a great way to protect your home, family and your possessions, but you may not realize just how far security alarm technology has come in the last few years. If you are still thinking about those traditional alarm systems with their simple pushbutton keypads and confusing panels, you are way behind the state of modern alarm technology. Thanks to advances in fields like cloud computing and machine learning, home security systems can now leverage smart home technology to provide better security and more convenience. For homeowners that are interested in improved home security, there are some significant advantages to installing a smart system. In this post, we are going to explain some of the advantages that come with having a smart home security system installed by Cornerstone Protection. One of the most noticeable differences for the user is going to be the controls for the alarm system. With a smart security system, the traditional keypad is replaced with a touchscreen display. Instead of something that looks like a bulky calculator, you have a control panel that looks more like a tablet. 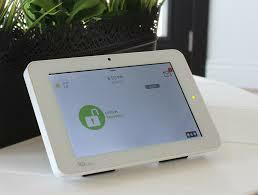 These smart control panels also use touch and swipe controls, which are far more familiar to most users. With touchscreen controls and an intuitive interface, users will have a much easier time managing their home security system. When you use the control panel, you will see menus that can guide you through a wide range of different features and it is easy to program in new settings. Along with that, many of these systems are compatible with mobile apps that can make it even easier to manage and monitoring your home security. This may seem like stating the obvious, but smart security systems are smarter than their older counterparts. With a traditional alarm system, you had devices that connect to a panel and the panel would communicate with a monitoring service. That is still true of the smart home security systems, but the advances in technology help to add new layers of protection that were not possible with older alarm systems. When you had one of the traditional alarm systems installed, the installer would program it to respond in different ways to different events and the system had to be armed for it to respond at all in some situations. While a smart system can still be programmed for different features and responses, it also has the potential to provide continuous protection even when it isn’t armed. It can send you text alerts to let you know when your kids get home; it can alert you to the system being disarmed when you are away from home; it can even keep access records to let you know who is arming and disarming the system at different times. Home automation systems are growing in popularity and consumers now have a wide range of connected devices that can be used to make their lives easier and improve efficiency around the house. While this technology is getting more popular, you need to be careful when connecting home devices to the internet or through wireless systems. Not every home automation system is as secure as you may think and some of them can be vulnerable to attack. When you get a smart home security system that supports automation features, you get all of this smart home technology in a secure platform. The smart systems installed by Cornerstone Protection use features like advanced encryption to protect your devices and your home. Along with the security alarm features, we can also install home automation devices like smart devices like thermostats, locks, garage doors, lights, plugs, doorbells and more. One of the best features of a smart alarm system is that it can connect with a smartphone app to allow for remote access. Sure, the app can be used around the house to act as a convenient controller or to monitor your cameras, but it also adds tons of great features for accessing the system when you are away from home. With a smart home system and the compatible app, you can arm and disarm the system without having to go to the control panel. If you forgot to lock the door, it can send you an alert and give you the option to lock the door without having to return home. If a family member needs to get in the house when you are away from home, you can also unlock the door and disarm the system to provide access. These are just a few of the remote access features you can expect when you have a smart home security system. Older security systems connected with the monitoring service through a telephone landline. This could leave the system vulnerable to the phone line being cut. With the newer smart systems, the control panel can use multiple paths of communication. They can communicate over your home internet connection and they can also connect using an internal cellular communication system. With multi-path connectivity, your system is protected against some of the common ways criminals may try to compromise your alarm system. When you go with Kentucky’s top security alarm company, Cornerstone Protection, you get monitoring service that meets the highest standards. Our panels connect to a network of three UL certified monitoring centers. With three stations, all approved for fire and intrusion monitoring, your signals are guaranteed to reach a monitoring professionals and get the correct response. Smart alarm systems are compatible with a wider range of devices than traditional alarm panels. Just to name a few, you have your motion sensors, smoke detectors, cameras, smart locks, lights, thermostats, flood sensors, voice control systems, CO2 alarms, ceiling fan controllers and more. With so many devices to choose from and a wider range of programmable features, smart security systems offer a level of customization that was not possible in the past. As an example, the system could be programmed to turn on all the lights when the smoke detector trips the fire alarm. If there is a fire at night, having the lights come on automatically could help you and your family reach safety. You could also purchase devices that will shut off the water if the system detects flooding. If you are away from home when a pipe bursts, this could prevent a considerable amount of water damage. For better security and an alarm system that is designed to fit your lifestyle and your needs, smart home technology is the way to go. If you are interested in installing a smart home security system in Lexington, Kentucky or the surrounding area, contact Cornerstone Protection for a free consultation.